From Trwyn Du follow buoyed channel to B10. Keep Castle in line with buoy to anchor in Pool in 2-3 m. Alternatively turn in to moorings anywhere between pier and Gallows Point. Mooring buoys abound, many drying, some in navigable channel. Banks are steep-sided and of hard sand. Uncomfortable on moorings, untenable at anchor, in north-easterlies; otherwise safe under all conditions within bay. Pool very exposed from most directions until banks show, then strong north-easterlies may break. In Bay, good holding; dries to mud with stone beach. 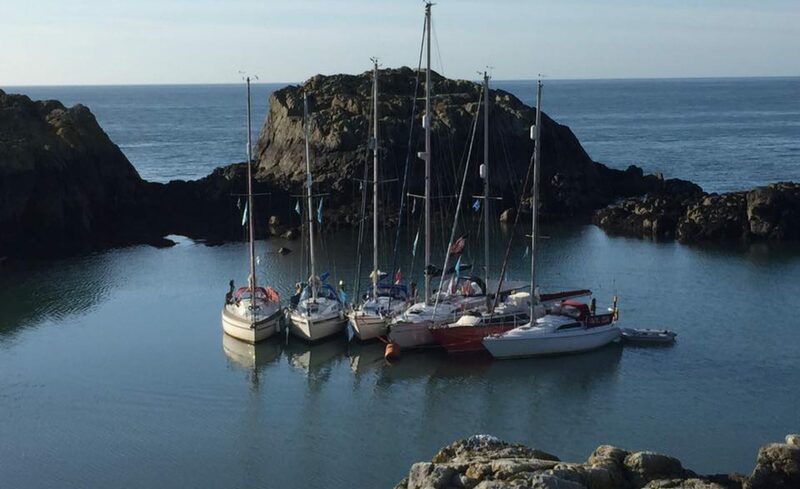 Boats frequently beach at foot of stones at Gallows Point for access to N.W.V.Y.C. CLUBHOUSE and for scrubbing off. Chandlery, diesel & petrol, repairs, hauling out, Calor Gas at boatyard. Telephone, showers and water at Clubhouse. Bus service to Bangor. Hotels, restaurants, public houses.